Marriage in yellow! | Cosa Mi Metto??? Our friends Giorgia and Alessandro get married last week and for the occasion I decided to wear this yellow dress from AX Paris. Due to the heat and to the facility with which I realize it, I opted once again for this big bun. Maybe one of these day I'll show you how to create it with a video tutorial, you might be interested? I nostri amici Giorgia ed Alessandro si sono sposati la scorsa settimana e per l'occasione ho deciso di indossare questo vestito giallo di AX Paris. A causa del caldo e della facilità con cui la realizzo, ho optato ancora una volta per questa grande cipolla. Forse uno di questi giorni vi mostrerò come si crea con un video tutorial, vi piacerebbe? Very very pretty! This dress looks absolutely gorgeous! What a beautiful compliment to your suntanned skin! The yellow dress is a glorious and pretty dress to wear to a wedding! You have a chic and effortless style! Very beautiful smile too! Congratulations to your friends! Heartbreaking images honey!!! Totally loved this post!! !Your blog is just the coolest.....We are already following each other. Simply gorgeous! 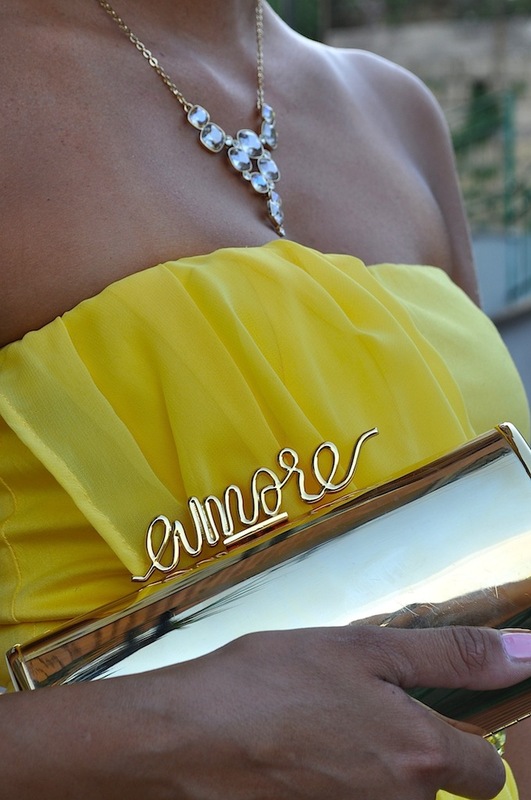 Love that yellow dress and clutch. Perfect for weddings. Love the dress! Looks beautiful on you! love the clutch, the hair bun..you look good in yellow too! Bella bella! Poi così' abbronzata il giallo ti sta d'incanto!! that yellow dress suits you best . Il vestito giallo ti sta divinamente e con la pelle abbronzata risalta ancora di più! Gli accessori oro sono perfetti e la borsetta che carina! Aww I have a thing to yellow dresses, they are so cheerful! Wow, this dress is sooo stunning! Perfect dress for attending a wedding! Love your choice of gold accessories! Dress is so chic! but I would say that necklace killed whole outfit!! You should rather take some huge earrings. Bellissimo il giallo accostato alla tua carmagione!! Come organizza il proprio armadio Kate Moss? wow sei un sogno! questo vestito è divino e ti sta d'incanto!! non finirò mai di dirlo .. adoro questa clutch!! Wow...What a classy and vibrant dress...you're stunning :)! Wonderful! I love your dress!! I love how you accessorized this dress, which is amazing! That clutch is super cute, love it. Following you by GFC, Bloglovin, Facebook, Twitter and G+. Beautyy!!! :) Hun that dress looks gorgeous on you!! This dress is amazing, and the color looks so great on you! Bellissima e adorable come sempre. Baci. I looove this dress, gorgeous ! Wow!! Your dress is awesome!! We love it!! Davvero d'effetto questo abito, il colore mi piace tanto! L'hair bun è un classico, raffinato e adatto ad ogni occasione! posso chiederti un favore? devo andare ad un matrimonio e questo vestito mi piace tantissimo posso chiederti che taglia hai preso perchè non riesco ad orientarmi con le taglie non avendo mai comprato in quel sito!! :) grazie in anticipo! Ciao Federica, io ho preso la taglia 8 e normalmente porto una 40! Divertiti al matrimonio! che bello questo vestito:)molto principesco!! i just follow you honey , thanks for your comment <3 can you follow my blog , if you like ? Such a gorgeous colour, really suits you!! exquisite!! that colour looks amazing against yr skin! and the gold tone of the accessories complete the look... jus discovered yr blog and i'm following you via GFC... hope you follow back.. This dress is absolutely amazing. I Love it! You look so pretty. Your gold and yellow look is amzing! I'm in love with your shoes!! Estas fabulosa con este vestido! I love yellow, beautiful! I'm following, hit me back! What a gorgeous yellow dress – perfect for a wedding! This color looks amazing on you! The yellow and gold looks absolutely stunning with your tan! I hope you had a wonderful time at the wedding. Such a beautiful dress!! Love it! I'd love to follow each other. I am now following you please follow back. Beautiful yellow dress. Thanks for the comment on my blog. I have been following you now for quite some time on bloglovin! If you haven't been following me I'd love you to follow on bloglovin as well. you look wonderful :) i'm following you honey! i'm waiting you on my blogs! You look stunning! Thanks for your comment on my blog - I would love to follow each other! Following you now. Sei bellissima, il giallo ti dona molto! You look stunning, beautiful dress and I love your purse and the hair style!Thank you for visiting my blog, you asked me if we can follow each other, but we already do, last week I followed your blog and you are one of my followers. Let me know if you didn't leave this comment, I HOPE IT IS not a spam. il vestito è splendido e ti sta benissimo! Your friends are sooooo lucky to have you attend their wedding in this gorgeous yellow dress that really compliments your stunning bronze skin tone! Would you like to follow each other? Your blog content is juicy! This yellow drees is fantastic! I hope that you have fun the wedding. About following each other, here I am. So I'm waiting in my little universe. Kisses, Judith. This is such a wonderful outfit!! I'm in love with your clutch!! What a beautiful color! Follow me back? muy bonito el vestido en amarillo! Perfect choice for wedding! You look beautiful! Love these photos & that clutch is to die for! You are adorable! So glad you found my blog, I will be following you from now on! muito lindo tbm! na cor amarela ficou o máximo . brigada pela visita e comentário. thank you for the lovely comment on my blog- i love yours! this dress is stunning! and I wear my hair in a bum when i get hot too! You look gorgeous! I love the sandals! great dress honey, i have the same but in blue! You look gorgeous! I love this colour on you! Stunning! this color goes so well with your tan! And I am in love with the detail of the Moschino clutch! Wow cool blog and love this dress! Thanks for the lovely comments on my blog and yes I would love to follow each other! You look stunning dear! I love your dress! Fabrizia Im so happy that I found your blog, I really like it! Im your newest follower :) Would you like to follow back? you look like a goddess. this dress is perfect!!! So I am following on Bloglovin, Liked you on facebook and following on twitter. Please follow back and thanks for all the suggestions on the follows. I am not on the other sites. Love your site and thanks for networking. Bellissima in giallo , stai divinamnete poi con l'abbronzatura !!! That dress is so beautiful. I love that colour on you! I look at your blog, I can tell you it is superb. Eh beh fabry questo vestito ti sta da dio!!! Thanks for the comment, really liked this post and I'm now following! Looove the dress!! And love your blog! Love your blog! :. I'll definetly follow and come back soon :). Come by my blog is you want too and follow :). I just started blogging yesterday :). I can get good ideas when I come here and enrich my experience in fashion. This dress is beautiful, the colour is gorgeous on you! And would love to see a hair tutorial on this! Of course. :) Your clutch is wonderful! adoro quest'abito, ti sta divinamente!!!! Such an awesome look, you´re so nicely tanned! Thank you for your comment on my blog, you´re the first, I was so excited to read it :-D Of course, let´s follow each other - done! You look so gorgeous and elegant in that dress!. I love it. BEautiful dress! You look glamorous! Hi doll, thanks for visiting my blog! You have such a great blog and you are so stunning! I love your outfit posts and I can also see that you love playing with color as I do! I am following you now, lets stay in touch! Love your dress and love your smile. You look absolutely stunning in this dress. WOW!! I would love to see a tutorial on your bun. Thank you! And for the one who wished it, I will make a tutorial for the bun! Grazie! E per quelle che lo desideravano, farò un tutorial sulla cipolla! Yellow in sun-tanned skin is just irresistible! What a beautiful dress, you look fantastic! wow! so beautiful dress! i love your blog, it's amazing! of course i would like to follow each other! i follow you now, follow back? I love your dress ! You are pretty. I like your blog, Do you want to follow me each over ? If you want of course. I would like to have your opinion in my blog. If you want, I have a facebook page. beautiful dress..and thnaks for the comment on my blog...im now following you.. I hope your visitor to my blog. Gorgeous outfit! Thanks for the comment! Im followin u now. Hope u follow back! Sei esageratamente stupenda con questo vestito..
omg! U look amazing! beautiful dress;) J.